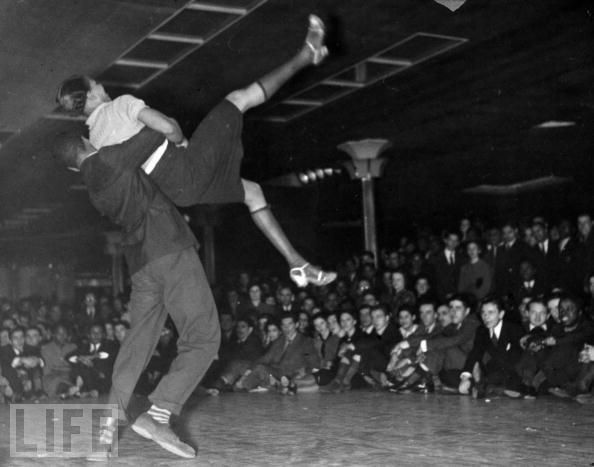 The Short Story About The Swing Era’s & Swing Dancer’s Mecca ….. 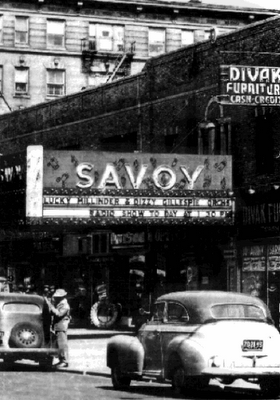 The Savoy was a two story ballroom which spanned the whole block of 140th. street to 141st. street on Lenox Avenue in Harlem, New York. no smoking allowed on the floor and offenders were abruptly ejected after one warning. Each night cleaners scraped off offending pieces of gum, scrubbed and swept the whole floor, then it was polished ready for Charlie Buchanan’s meticulous morning inspection. This was not just for cleanliness but also for its own sake. Some Iconic Pictures show the intensity of the dust, especially on the men’s clothes that resulted from the polish being ground down each night. The floor had to be kept in excellent condition. Being one storey up periodical checks ensured it didn’t collapse and send the dancers crashing through to the floor below. The Savoy could have anywhere from 4,000 to 5,000 people walk through in a night with about 15% of the people being white. Depending on who the band was, the ballroom would more than double its capacity. 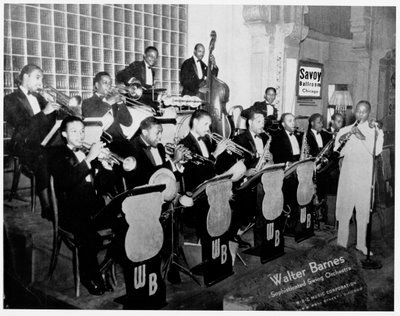 When Benny Goodman brought his big band to play at the Savoy (it was reported that there was approximately 25,000 people waiting to get into the ballroom when Goodman came to town). The ground floor of the building housed the entrance to the ballroom at the center of the block signified by the marquee-extending out over the sidewalk and various stores. The spacious basement checkrooms could serve up to 5,000 patrons with swift and efficient ease. Billed as the “World’s finest ballroom,” the Savoy was complete with large luxurious carpeted lounges and mirrored walls. The club was only open to the public five nights a week, with two days being reserved for private Parties/Functions. The normal Cover Charge was between $0.30 cents to $0.85 cents in the early 1930′s (you could also become a member for cheaper prices).During the depression the cover was lower and the Savoy would setup free Holiday dinners for the homeless or poor folks in the area for free. Over 250 name and semi-name bands were featured at the Savoy. The two bandstands allowed continuous live music all night, and provided the stage for the famous battles of bands. 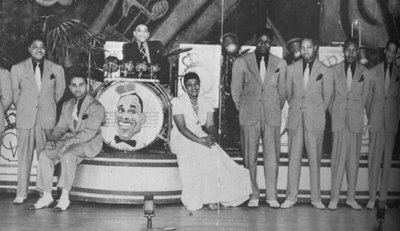 The most famous, and one of the most highly publicized, was the battle of Chick Webb vs. Benny Goodman, when both bands were at the crest of their popularity.There were approx. 90 permanent employees at the Savoy, which included musicians, waiters, cashiers, floor attendants, porters and administrative assistants. There were also hostesses with whom a visitor, mostly from downtown, could dance for a dime or be tutored on the latest steps, as well as a team of bouncers clad in black tuxedos and bow ties. The bouncers were ex-boxers, basketball players etc., who would rush in on a moment’s notice and put out any person. A long succession of dance fads were launched from the Savoy that swept the nation and overseas in response to ever changing music trends from dixieland, ragtime, jazz, blues, swing, stomp, boogie-woogie, bop to countless peabody, waltz, one-step, two-step and rhumba variations. Among the countless dance styles originated and developed at the Savoy were: The Flying Charleston, The Lindy Hop, The Stomp, The Big Apple, Jitterbug Jive, Peckin’, Snakehips, Rhumboogie and intricate variations of the Peabody, the Shimmy, Mambo, etc. 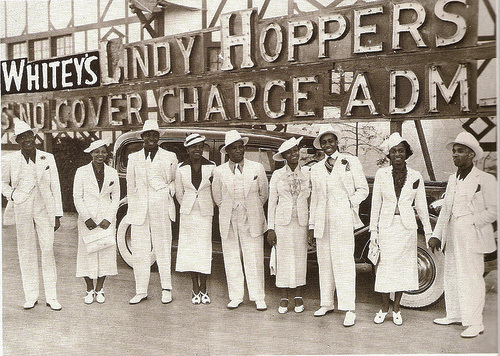 With Lindy Hop being said to originate at the Savoy, the ballroom was known as the “Home Of Happy Feet” and had the best Lindy Hop dancers in the Nation. The best of these dancers would hang out together in the North/East corner of the Savoy, this became known as “Cats Corner”. The leader of the pride was Hubert White (a.k.a. Whitey, an ex-boxer and bouncer at the Savoy) and the group was commonly known as “Whitey’s Lindy Hoppers.” Whitey’s right hand man was none other than Frankie Manning who later took over as their leader. harlem new york harlem new york lindy hop lindy hop swing katz sydney swing katz. Dance Contest’s were also popular at the Savoy Ballroom and the contests were generally held on Wednesdays with prizes going to third place. First place was around $40.00 in the early days and a chance to perform a solo dance exhibition at the Savoy. The Harvest Moon Ball held it’s prelims for the Swing division at the Savoy Ballroom, then later at the Savoy Manor. By the 1950′s there were many Mambo contests held at the Savoy as well as Jitterbug on Monday nights. As the 1940′s approached, prohibition came and went and now Drugs were becoming a real problem throughout the country and Harlem and the Savoy, although the Savoy out resisted all the others, it to would not be immune. By the 1950′s the scene in Harlem had totally changed and the Savoy (and all the other nearby ballrooms) were losing there luster, large numbers of clientele and money to the much smaller and seedier drinking clubs. They were either closing or would be shut down left and right. The Savoy tried many different things to try to get things back to where they were, but the people were not coming to the club’s in Harlem like they used too in 1958 the building eventually had to give way to a much needed housing complex (Unfortunately today there is no trace of the ballroom ever being in that location). The Savoy tradition of the Lindy Hop continues to thrive to this date thanks to films and other documented accounts as well as legends such as Norma Miller, Frankie Manning & Al Minns. 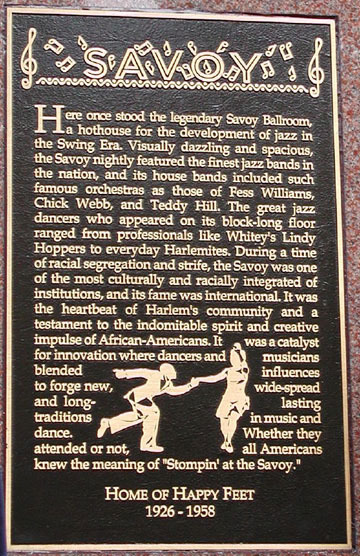 On the 26th May 2002, a commemorative plaque for the Savoy Ballroom was revealed at 140th. street to 141st. street on Lenox Avenue by Frankie Manning and Norma Miller, it is a standing legacy to this great ballroom and what it had achieved socially, musically and in dance. Trivia: Why call it Savoy? Apparently they were looking for a classy name, and decided that the Savoy Hotel, in The Strand, London was the one to imitate. There’s no copyright on the name as the London Hotel’s (that featured jazz even before it’s Harlem namesake opened) name refers back to the Savoy Theatre that it was built next to, which in turns referred to the former Savoy Palace that stood on the same site until rebellious peasants burnt it down in the 14th century. Even that name was brought over to England by royal relatives of Henry III who had some kind of claim on the province of Savoy in Italy that was then an independent state! In Italy Savoy became the name of the Italian royal family, who because of their collaboration with Mussolini’s fascist dictatorship in the 1930s now live in exile. The Harlem Savoy came to stand for a totally different set of values! My friends and I are traveling from New Jersey to Harlem 3/12/2011 for your Swing dance. We are truly excited. Can’t wait! It will be a blast!